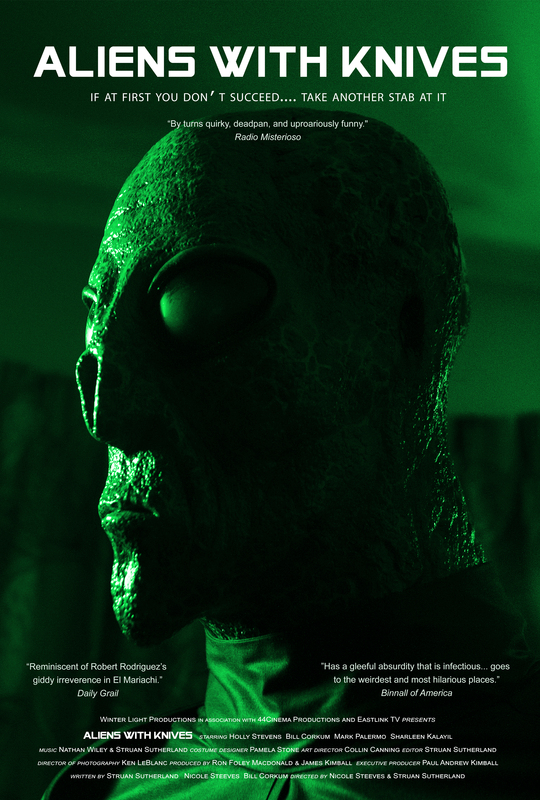 From directors Struan Sutherland and Nicole Steeves comes the independent feature film “Aliens With Knives,” which premieres as part of the Cinema 902 series for Eastlink TV on Saturday, April 7th at 11 pm. In this dark comedy, Neila (Holly Stevens), a discontented pregnant woman, is prescribed some rest at a cabin in the woods with her unstable husband Dan (Bill Corkum). When a creepy stranger (Mark Palermo), a mysterious doctor (Sharleen Kalayil), and some space aliens show up, Neila has to embrace her survival instincts in order to save not only her unborn child, but all of humanity. Produced with the assistance of the Government of Nova Scotia, Nova Scotia Film and Television Production Incentive Fund. Filmed on location in Nova Scotia.